I've build a toolbox in my project environment to plan "Aids to Navigation". The vessel (ship) that does the actual work in the field has a navigation computer that can only import waypoint. These waypoints are stored in a *.wpt file, that is just a text file with a few lines per waypoint. So to make this file: I've prepared a layer that grabs the geometry from my planning tool and displays the data as a HTML maptip in the correct manner. I show all the waypoints I need (1 by 1), select the text, copy the text and paste it into a text-editor. After pasting all the waypoints in one file I save it as a .wpt file. This isn't a lot of work when designing small projects. But with 30+ mutations it isn't very efficient. You can store all that information in one long text field, including the line breaks with '\n'. Use this expression in the Field Calculator to create a new textfield, called "printout". Make sure the field length is plenty long enough to store the longest possible combination of characters. 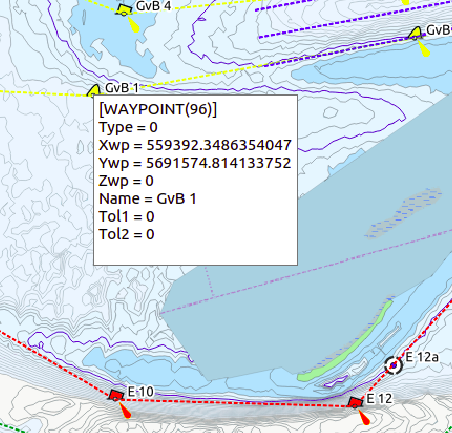 Note: I'm assuming that you have fields called WAYPOINT, Type, Name, Tol1 and Tol2, and the Xwp, Ywp and Zwp values are just the X, Y and Z coordinates of the point. If you need another line break to separate the records, just add another || '\n' to the end of the expression. Export the layer as a CSV file. Unselect all columns other than "printout". Choose "no geometry". I did find that if I opened the CSV in Notepad, the line breaks were not preserved. Open the CSV in your text editor of choice. Make any further edits as necessary (eg you might need to remove the column name, or the quotation marks, or insert a spacer between the waypoint sections). Save with the file extension .wpt. Not the answer you're looking for? Browse other questions tagged qgis export database text or ask your own question. Exporting each layer in map to separate image using ArcPy? Unable to merge CSV and CSVT with shapefile using QGIS due to “text” fields?